Before the snow arrives, there is work to be done in the vineyard to make sure the vines are ready for the next season. The compost has been building over the hot summer months and is then spread throughout the vines in fall using 2 year old mature compost. A layer of organic fertilizer is also spread throughout the vineyard. This is a feathermeal based fertilizer and provides a slow release of nitrogen and organic matter. Both feed the soil to feed the vine and provide a long term soil fertility building process. The 90 tonnes of pomace created through the harvest are then added to the compost that was started in the spring, to start the two year process of becoming the rich compost that is used to nourish the vines in the coming years. Hilling up around the vines is also done. This is to protect the graft union, root stock and scion. The scion is the varietal of importance and is typically less cold hardy than the rootstock. Hilling mitigates the cold and is the 1st step in weed management practices. The tractor creates these hills and is part of the mechanical weed control in the vineyard. Allowing us to "plough back" in the spring to unearth the vines. In addition a tractor will pass through the vineyard and do an initial cut or pre- pruning of the vineyard. This reduces the hand labour in pruning by starting to loosen shoots and remove excess shoot length from the wires. By removing shoots the nutrients will move only to the required buds. Once the snow falls vineyard staff are busy keeping the road to the winery accessible for commercial vehicles and a hectic schedule of clearing and plowing takes place. Charlie looks after the majority of our road and does an excellent job making sure we can all get safely to work. At the same time pruning starts and you can hear the electric pruners buzzing all over the farm. This takes 4 months per year with a small crew. Pruning is very important as is sets the crop potential for the coming season and all the plant work during the growing season. Pruning removes unwanted shoots and only leaves the required amount of buds and thus form the new bearing spurs and shoots for the coming season. For an overview on the processes that make up the overall activity in the vineyard please view /About-Us/A-Year-in-the-Vineyard or view our tour of the vineyard video with Ian Mavety. Proprietor, Ian Mavety discusses the various sustainable viticulture practices used at Blue Mountain Vineyards in the video above. 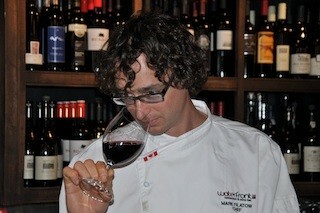 Wishing Waterfront Restaurant and Wine Bar, Mark Filatow the best of luck this weekend at the Canadian Culinary Championships. Mark is representing BC this year. Check out this great interview with Chef Filatow. Good luck to all the other visiting Chefs from across Canada! The Canadian Culinary Championships will be held in Kelowna until 2015 so if you missed out on tickets this year make sure you book early for next year. Waterfront Restaurant and Wine Bar owner, chef and sommelier Mark Filatow is ready for the Canadian Culinary Championships.